Le Petit Bijou is in the village of Saint Fraigne in the Charente region of France. The gite is a traditional Charentaise house estimated to be over 250 years old with many original features, decorated by blending traditional style with modern conveniences. The house is situated on an acre plot of which is 1/2 acre mainly laid to lawn, edged by a small river. The heated 10x5m pool has loungers and umbrellas. We have a 6 person hot tub and a games room with pool, table tennis, darts and other facilities. We moved from UK to the beautiful village of St Fraigne in October 2015. We gave up our busy jobs of Mortgage Advisor and Early Years Practitioner to enjoy the 'French life'. This was the start of our new adventure. A beautiful working farming village location with an award winning boulangarie and a bar only 2 minutes walk away. We fell in love with the village at first sight and decided we wanted to live in St Fraigne, and within 3 months had bought our dream property. The property has the character of a typical French stone built house with up to date amenities. A beautiful pool in a large garden ideal for relaxing moments. Lots of long walks and bike rides to keep you occupied.Many local lakes with fishing swimming and sand. Ideal base for visiting Poitiers, Angouleme (both with numerous attractions), La Rochelle, chateaux and the coast. The towns of Ruffec and Rouillac are within easy reach for cash machines, fuel, shopping and local markets. We are within a five our drive of Roscoff, Caen, St Malo and Dieppe, Calais and Cherberg are slightly longer drives. 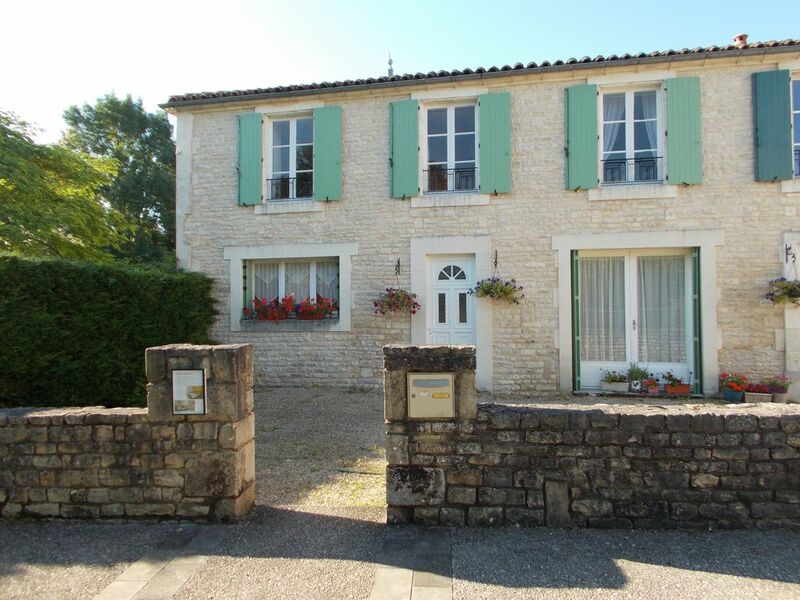 A fantastic base for exploring the wonderful Charente countryside! Shower and a separate wc located upstairs . Also a wc downstairs. There are also shower and toilet facilities by the pool. Well you are on holiday! Open plan with dining area overlooking garden. Large table seats 6.
hundreds available I'm an avid reader and a wide selection is always available . Yes and it's set to free play. giant Jenga, 4 in a row trampoline and lots lots more. large garden with a pond and stream running through. Trampoline and swing for your enjoyment. Rackets and balls provided. Court located in village. Thank you, we are so pleased you enjoyed your stay. Good luck in Switzerland. We have bought a large fan as it’s been so hot. Lovely holiday with great pool. Jason and Alison couldn't have been kinder or more attentive hosts. They really tried hard to look after us. The house was well equipped and very clean and our children (2 girls aged 6 & 7) loved the large safe garden with trampoline. The pool was also lovely and perfect for our youngest who is just getting the grips with swimming as it has a good shallow end. It is shared with the B&B guests and also in the evening, the owners. Whilst you can walk to the baker in the village which is great (and it is very good), everything else is a bit of a drive so be prepared to travel if you want to explore. Overall we had a lovely holiday. Our family of seven had a most enjoyable stay at Petit Bijou. Our stay was 2 weeks long. We got a very warm welcome from Jason and Alison and throughout our stay they were very helpful in lots of different ways whether it was in answering any questions about the locality and what was to be seen or where we could have lunch. They even organised for us to share in the local communitys Bastille Day feast. At the property itself we had the use of bikes, a really well equipped games room, a large field (for throwing a rugby ball) and of course the pool - which was the big attraction for our 5 teenage boys. Only a 2 minute walk away is a tennis court which we used every evening once the temperatures had dropped and a stones throw away is a boulangerie which we visited every morning. While the property itself provided lots to entertain us we did venture to gokarting and a tree climbing park, both of which are just under an hour away. Decathlon and of course Intersport were located and visited more than once. Overall the holiday was exactly what we wanted and the property and its location was ideal. Un paradis pour les enfants! Petit bémol ...il manquait un peu de chauffage à notre goût . Les températures étant encore un peu fraîches et un peu étonnés par le choix du « tout anglais » ( chaînes de télé, notices, documentations sur les visites à faire) mais nous n’étions là que pour un court séjour donc pas vraiment gênant.